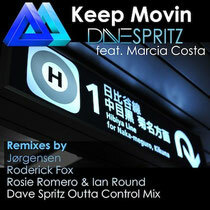 Dave Spritz releases his new track 'Keep Movin'' on the 10th November, complete with some very heavyweight mixes from Jorgensen, Rosie Romero & Ian Round and Dave's own Outta Control mix. Featuring the vocals of Marcia Costa, the is a track made for peak time floors around the world, whether you prefer Jorgensen's tech house mix or Rosie & Ian's more melodic mix. To check out Rosie and Ian's mix, click the Soundcloud link below.